Runner helps you to get around Sketch quicker by giving you an intuitive interface to supercharge your daily workflow. 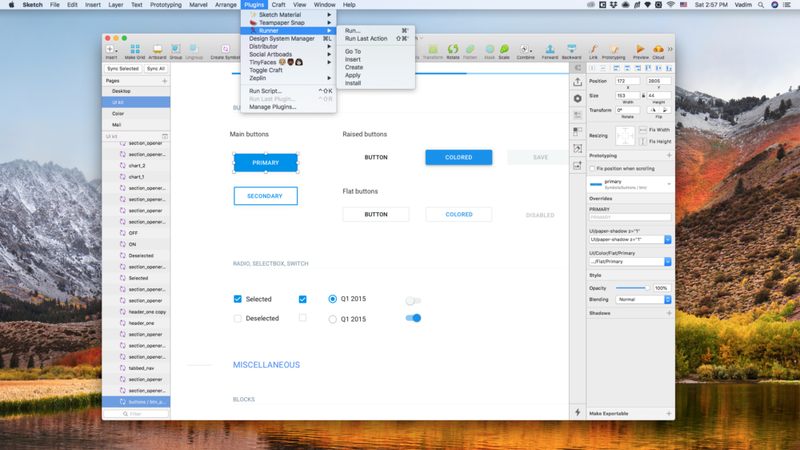 Marvel for Sketch is the ultimate companion for prototyping. The singular must-have in every UI/UX designer’s tool belt, Craftis a suite of plugins for Photoshop and Sketch that help streamline your design workflow by automating tedious actions and pulling in more realistic sample data. Sketch Material – We do the hard physical work, you focus on things that matter. Rename It – Sketch plugin that batch renames layers and a lot more. Rename and sort artboards based on their x and y position; Rename layers based on their Style and Symbol. A lightweight plugin that lets you sync layer & text styles with a Sketch Library, so your project is always in sync. This is a Plugin for Sketch App that adds artboard presets for the most common image dimensions of different social media platforms. A plugin to quickly include great looking images from Unsplash in your Sketch projects. Because being able to quickly iterate on UI is important but also having great photography as placeholders is not that bad. A Sketch pluginto easily edit your nudge distance settings. This list will be upgrading. If you know some great Sketch plugin, please add a link in comments. Sketch plugins — what we usually use in our team was originally published in Prototypr on Medium, where people are continuing the conversation by highlighting and responding to this story.